Of the three Japanese RPGs game-starved Wii owners have been begging Nintendo of America to bring stateside, the one I'd most like to add to my collection is Xenoblade. Thankfully, that Monolith Soft-developed game will be released in Europe in just a few months--on Sept. 2, to be more specific. When the game hits the streets of London--or Paris or ... wherever else it'll be sold in Europe--it won't be called Xenoblade, though; no, the powers that be at Nintendo of Europe had to spruce it up a bit, make it sound more "epic." As a result of their shenanigans, it'll be called Xenoblade Chronicles when it arrives on European shores. Although I think it's a completely silly, not to mention completely unneeded, change, it didn't keep me from pre-ordering a copy of it this morning after hearing that thehut.com is selling the standard version of the game (not the special edition pictured to the right) for the bargain-basement price of £29.85 (about $48). 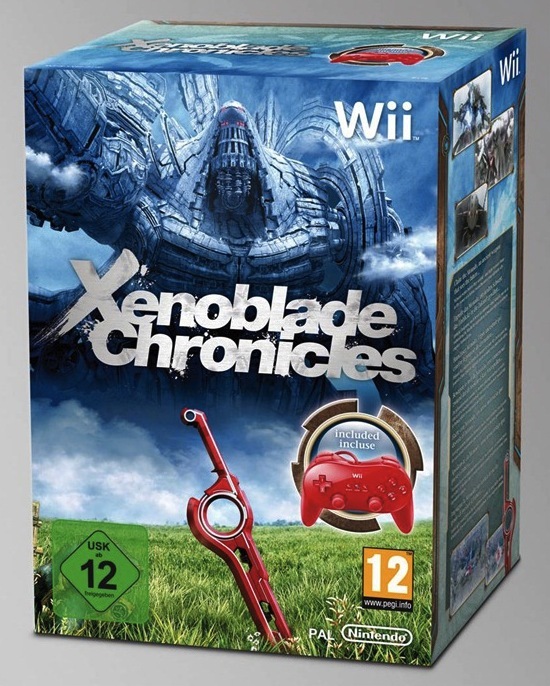 I should also add that, had it been an option, I would have pre-ordered Xenoblade Chronicles from sendit.com instead, as I've ordered Euro-only games from them in the past and have never experienced any issues. Unfortunately, they aren't allowing people to pre-order it at the moment. Anyway, I'll let you know what comes of all of this. I'll also let you know when and if the other two Japanese RPGs North American Wii owners have been clamoring for--The Last Story and Pandora's Tower--are given European release dates. I hope your purchase through TheHut goes well. I know I always get nervous when trying out game/accessory vendors for the first time. I'm probably not going to play Xenoblade or any of the other "Project Rainfall" games for a while but I'd still like to hear what others think. In regards to your side note, have you never received things from overseas then? EBayers tend to work fast but online shops like to use shipping by boat, which is why it takes so damn long. Once I bought a PS2 item from some random Asian shop (terrible idea) and it took 2 months to show up. I totally figured I'd been scammed lol. I hate to tell you this, but TheHut/Zavvi are pretty bad for fulfilling orders, often leaving people hanging for months. I'm sure the more reputable UK places will start allowing pre-orders once they have more product information, especially because of the pricing on the bundled version. Thanks, Hayden. I already knew about the shop's issues -- I just decided to risk it anyway. That said, I may cancel that pre-order once (if?) sendit.com starts allowing pre-orders, even if they charge a bit more for it. I'd definitely prefer to buy it from a store that I've dealt with before! I won't do it. Ever. I won't give my money to Nintendo for games they don't localize. It's ridiculous. Oh, I understand and respect that, Justin, but there's no way I'm passing on this game. I've been salivating over screens and videos and reviews of it since it was released in Japan. At least this way the money is going to the folks who deserve it (Nintendo of Europe). Plus, I buy non-localized Japanese games (like the original Rhythm Tengoku for GBA, etc.) all the time, so this really isn't any different. Oh, I completely understand that, Bryan. Maybe some day I will...but I'm just incredibly biter about it right now. 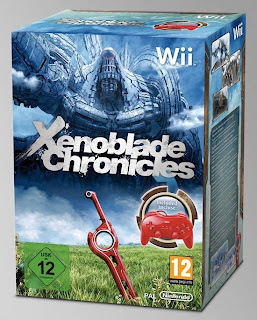 And as I write this comment, I just found this: http://mynintendonews.com/2011/07/08/nintendo-wii-american-localization-of-xenoblade-is-complete-last-story-coming/ What? !